After a long, rough morning of doing tai chi, hsing-I and pa kua in the park by the Chattahoochee River, I came home starved. Mac & cheese would have taken too long. Lucky for me, I had picked up some lovely organic heirloom tomatoes at Whole Foods. Ripe, fresh tomatoes should not be confused with tomatoes picked green and turned red with chemical reactions. When you’ve got a real tomato, you’ve got a meal. I lined a salad bowl with fresh spinach, then halved and sliced the heirloom tomato and laid them out over the spinach. 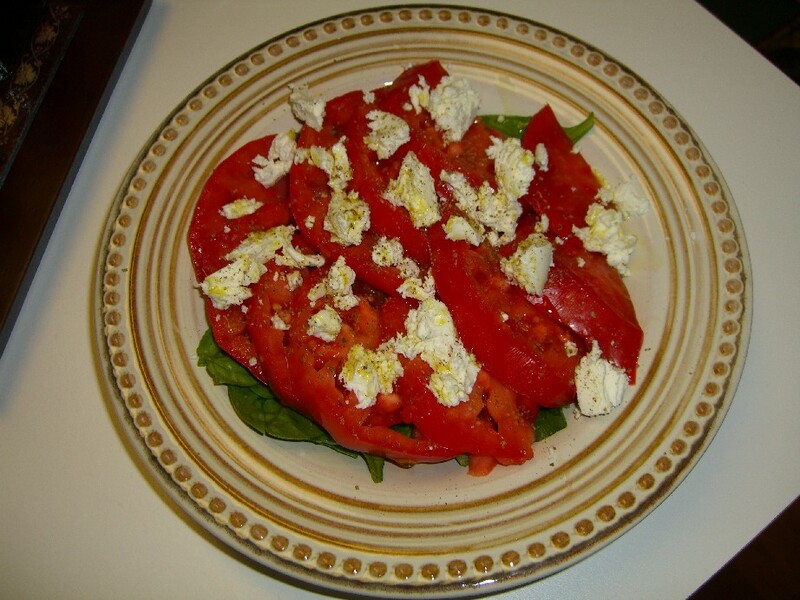 Costco has a great goat cheese (Ile de France) so I sprinkled some crumbles of that over the tomatoes. Lightly salted and peppered then drizzled with good olive oil and BAM. Fast food lunch. It took me less than five minutes to produce this work of art. And tasty! Woohoo! McWhoever can kiss my behind. I have a lot of Norwegian ancestry. I get excited when Norway is in the news. I root for Norse athletes in the Olympics. My home town is full of “I-wegians” (Iowans of Norwegian descent) and is one of the few places where you can find lutefisk on the Sunday brunch buffet. It’s probably that lutefisk that made me run screaming in the other direction when confronted with traditional Norwegian cuisine. But the challenge was put out there by a few of my family members to try some Norwegian food, and far be it from me to back down from a challenge. So earlier today I hit the web in search of some palatable recipes to celebrate my heritage. Skeptical? You betcha. Lutefisk recipes? Uff da. They abound. But to my delight I did find a number of recipes that not only sounded edible, but even downright tasty. Since I had a large amount of spinach calling my name from the fridge, I decided on Spinach Soup, or Spinatsuppe. I followed the recipe with a few minor exceptions. First, I halved it since there’s only two of us in the house. Second, I used vegetable stock instead of chicken stock. Third, I used regular pepper instead of white pepper since I was out. The recipe was deceptively simple, yet yeilded a delicate soup with really rich flavor. The hard boiled eggs on top were a little strange to me at first, but considering I love hard boiled eggs on a cold spinach salad it made sense. They were a nice touch. I would definately make this again. 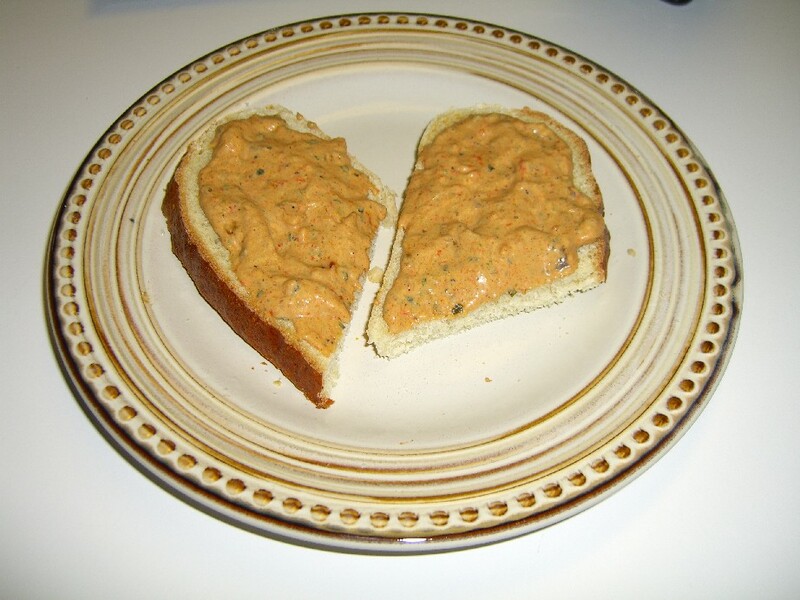 Brown’s Roasted Vegetable Spread. This stuff is the bomb diggity. Not only is it rediculously easy, but it is TASTY. I spread it over my homemade bread, lightly toasted, and had a fantastic meal. 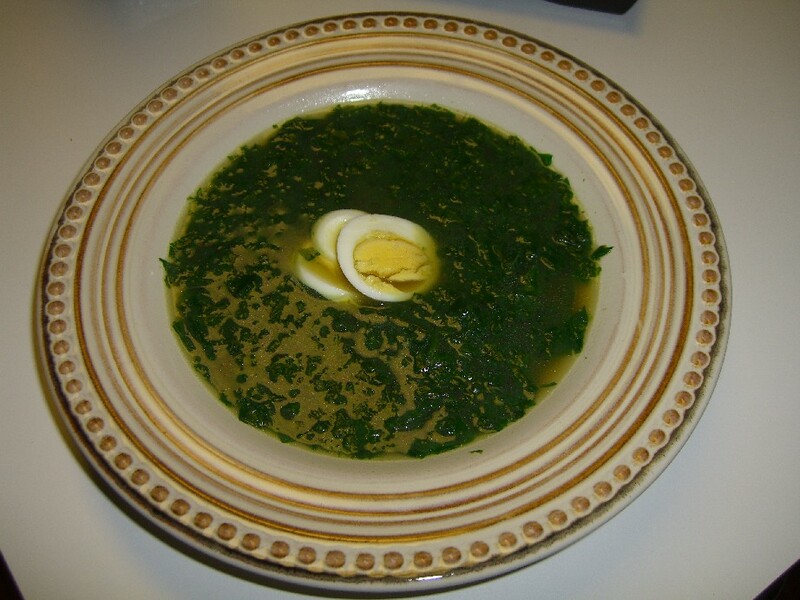 So the Spinach Soup definately warmed me up to some dishes from my ancestry. I’m not sold yet, but I’m definately planning on persuing more Norwegian recipes. I found some interesting ones here. More on this later.